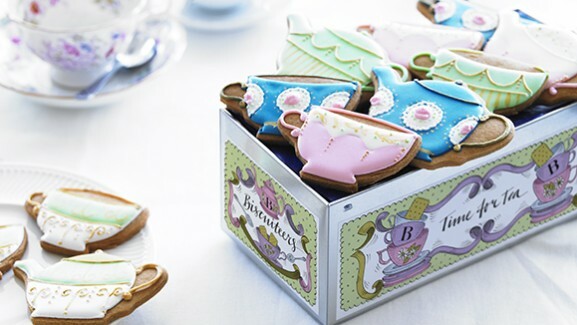 Biscuiteer Tea for Two – Why send flowers when you can send biscuits? “Why send flowers when you could send biscuits?” Why indeed?! This rather splendid question raised my expectations and I for one was not disappointed by the marvellous creativity of Biscuiteers – you could choose a tin of nativity biscuits – quite appropriate for time of year – or a tin of Christmas Tree biscuits – which they argue no Christmas tree would be complete without – and who am I to argue? …………Except there was no contest in my mind – Tea with Mary Kates immediate choice was a personalised tea for two – anyone for tea and an almost too amazing to eat biscuit?